With Google set to officially unveil its new Pixel handsets on October 9th, the company has launched a Japanese teaser webpage that hints at the possible colour variants that may make up the lineup. In English, the webpage declares “Coming Soon” and displays the familiar outline of a Pixel device. When viewed on mobile, the webpage allows visitors to cycle through three different landing pages by tapping on the centre of the phone. It’s also possible to tilt the image by tilting your device. On the first of the three webpages, we see a two-tone white phone with a neon mint inner outline. It’s likely the inner outline alludes to the accented power button that’s become a hallmark of Google’s smartphone design. This is backed up by the white models that have leaked in the past few weeks; they all featured a mint coloured power button. Next up is a model that corresponds to the current ‘Really Black’ Pixel 2 XL. Like that colour variant, this one appears to feature a two-tone black back with a plain black power button. The final colour variant, which hasn’t appeared in leaks, appears to be a two-tone mint model with matching mint power button. In a nice touch, should you wait long enough, confetti will start floating down from the top of the screen while viewing this page. For which colour variant are you most excited? Let us know in the comments. Update – September 27: According to reputable device leaker Roland Roland Quandt, Google will release a 3rd colour of the Pixel 3 and Pixel 3 XL and make it available in a “Sand” variant. 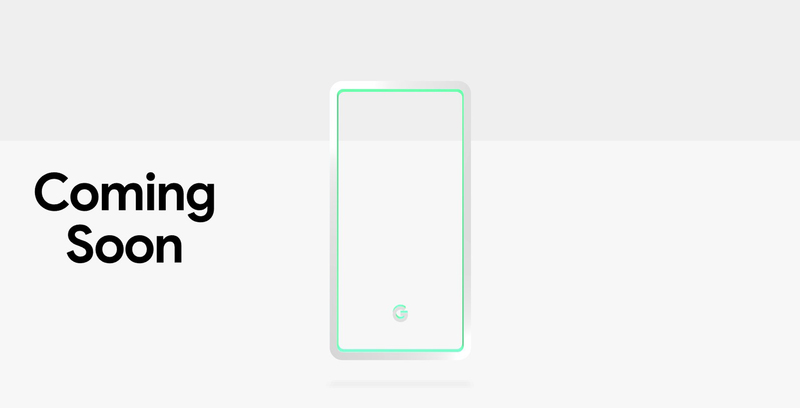 There is indeed a third color for the Google Pixel 3 and Pixel 3 XL. It's called "Sand".